The Tissington Trail runs along a 13 mile route from Ashbourne to Parsley Hay. At this point it joins up with the High Peak Trail, which runs from High Peak Junction to Dowlow near to Buxton. 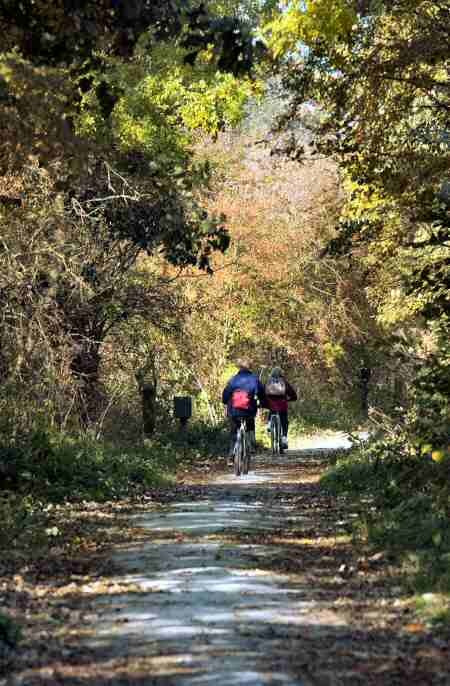 Surrounded by beautiful countryside the traffic-free trail is ideal for horse riders, cyclists, naturalists and walkers. It is suitable for wheel chairs and pushchairs along the flat sections. You can walk, cycle or ride a horse every day of the year on this wonderful traffic free trail and it will not cost you a penny. During all seasons of the year you will be able to admire the many stunning views. In the spring and summer, wild flowers are found in abundance and wildlife is plentiful at any time. Tissington Trail is mostly flat, once you have passed the relatively steep incline at Mapleton, near the southern end of the trail. 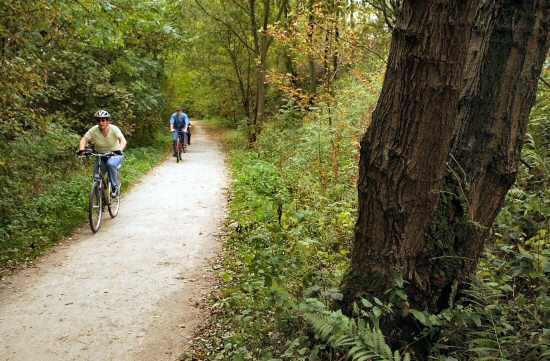 The trail is well surfaced and there is a car park and a seasonal cycle hire centre at Mapleton Lane, which lies just to the north of Ashbourne. Refreshments are also available. Further on up the trail, there is a small car park at Thorpe, once one of the railway stopping points. It is here that many walkers leave the trail to visit Dovedale. Some continue up the valley to Milldale, before eventually rejoining the trail at Alsop-en-le-Dale. Soon after leaving Thorpe, the car park at Tissington is reached, where both the car park and picnic area are much larger than at Thorpe and Mapleton Lane. Tissington is one of the prettiest and most unspoilt villages not only in Derbyshire but in the whole of the country. Neat well tended gardens and limestone cottages, behind wide grass verges and backed by mature trees, give a feeling of peace and tranquillity. No planner designed it; the beauty of the village is the result of evolution. Since the reign of Elizabeth I, the FitzHerbert family have managed the village, most of it having been rebuilt between 1830 and 1860 in traditional local style. The home of the FitzHerberts is an elegant Jacobean Manor, which stands just back from the main street behind a walled garden. The wall is broken only by a handsome 17th century gateway with wrought iron gates by the famous Derbyshire blacksmith, Robert Bakewell. When the railway came to the village in 1900 Sir Richard insisted that the line should be placed in a cutting. The Railway Company, it is said, built the cottages adjacent to the station in red brick rather than stone in retaliation for the inconvenience. Between Tissington and Alsop-en-le-Dale, another stopping point on the trail, where there is a small car park, there are many footpaths leading off the trail. The walk to Parwich through the Blatch Valley is particularly popular. The trail then continues to what was Hartington Station, which lies just over a mile from the village. The old signal box remains and there is a car park. A short distance after leaving Hartington, the Tissington Trail joins the High Peak Trail at Parsley Hay. Here you can either turn round and go back down the trail or follow the High Peak Trail as far as Dowlow. 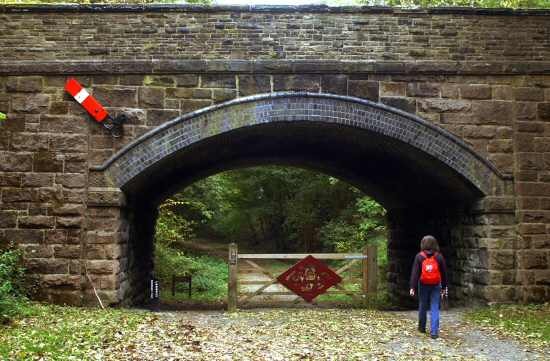 The High Peak Trail, originally carried The Cromford and High Peak Railway, the construction of which was considered to be an engineering masterpiece. It attracted railway enthusiasts, not only from this country but all over the world. It linked High Peak Junction at two hundred and seven-seven feet above sea level with Whaley Bridge at five hundred and seventeen feet. In the middle it rose to over a thousand feet at Ladmanlow. Stretching for thirty-three miles in length, the line was fully opened in 1831, when it was used to transport minerals, corn, coal and other commodities from one canal to the other. Runs from Ashbourne to Parsley Hay, for 13 miles along the former Ashbourne to Buxton railway line. At Parsley Hay, it joins the High Peak Trail, which continues along another former railway track to Dowlow near to Buxton. 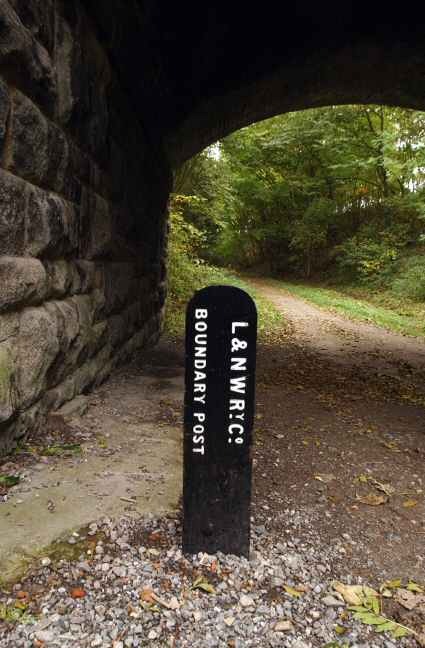 The traffic-free trail is available throughout the year for walkers, cyclists and horse riders. It is suitable for wheel chairs and pushchairs along the flat sections. Ashbourne (Tel 01335 343156) to the north of the town centre on the Tissington Trail, just off the road to Mapleton. Middleton Top (Tel 01629 823204) on the High Peak Trail near Middleton-by-Wirksworth, off the B5035. Parsley Hay (Tel 01298 84493) at the junction of the High Peak and Tissington Trails, off the A515 Ashbourne to Buxton road. 1. Keep to the left and give way when approaching all other users. 2. Please use your bell or give a warning so that other trail users know you are approaching. 3. On no account should you race along the trails. 4. Only designated routes should be used. According to research published by Direct Line, the UK insurer, more than 1,000 bicycles, worth an estimated £250,000, are now stolen each day in the UK. Most bikes are stolen because their owners fail to lock them securely. Ashbourne is without doubt one of Derbyshire’s finest towns, with a wealth of Georgian architecture. The triangular cobbled Market Place holds markets twice per week on Thursday and Saturday. Tissington Hall (Tel. 01335 352200) a fine Jacobean Manor House in the heart of the village that has been the home of the FitzHerbert family for 500 years. Open to the public for guided tours (see the Tissington Feature). Ilam Park lies on the banks of the River Manifold and includes a walk along an avenue of Lime Trees known as Paradise Walk. The 158 acres of the park is managed by the National Trust and there is a National Trust shop, information centre and tearoom. Entrance to the grounds is free to walkers. Dovedale many were the thousands who got off the train at Alsop-en-le-Dale Station and walked the length of Dovedale before catching a train home at Thorpe Station. The railway is no more, but cars still bring thousands of visitors to what is one of England’s most famous beauty spots. The Dovedale Sheepdog Trials attract big crowds every August. Roystone Grange where evidence has been found of occupation in Roman times by native hill farmers. A field system of that period can be seen by following the trail that has been set up. Another farm was established here at the time of the Norman Conquest and was later given to a Cistercian Abbey and developed as a sheep farm. Hartington a picturesque village with a spacious market place, village green, delightful duck pond and limestone houses, which sparkle in the bright sunlight, which make it one of the major tourist centres in the Peak District. It has more the air of a prosperous market town than a village. Visit the following pages on this website for comprehensive details of the area surrounding the Tissington Trail.